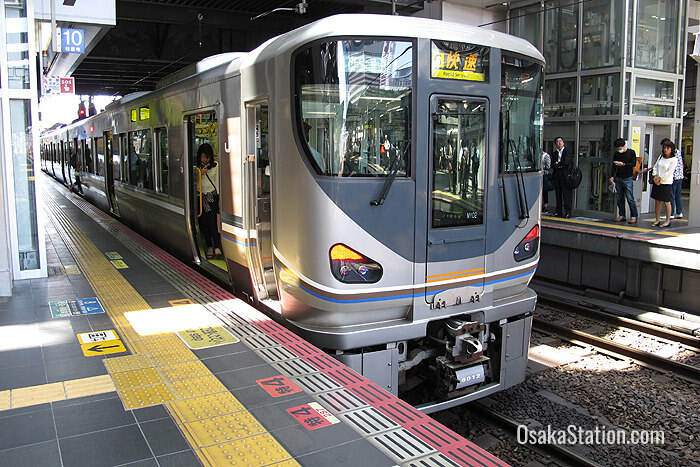 The JR Takarazuka Line is the name given to the route between Osaka Station and Sasayamaguchi Station in Hyogo Prefecture. Strictly speaking this consists of portions of two other lines: the Tokaido Main Line between Osaka Station and Amagasaki Station in Hyogo Prefecture, and the JR Fukuchiyama Line that runs from Amagasaki Station via Sasayamaguchi Station all the way to Fukuchiyama Station in northern Kyoto Prefecture. On this route, the main destination of interest for tourists is the hot spring town of Takarazuka. However, the route can also be used to explore the rural Tamba region of Hyogo Prefecture. Takarazuka is most famous as the home of the Takarazuka Revue, an all-female musical theater group. The town’s other attractions include its hot springs, the Osamu Tezuka Manga Museum, and the Tessai Museum which holds 1200 artworks by the renowned literati painter Tomioka Tessai. Aino Station is in the heart of the rural Tamba region that is famous for its pottery, or Tamba-yaki. Exit here to visit scenic Tachikui Sue-no-Sato or “Tachikui Pottery Village” or the Hyogo Museum of Ceramic Art. From the station take a Shinki bus headed for “Hyogo Tougei Bijutsukaikan”. Get off at Tou-no-Sato bus stop for the pottery village, or continue on to the museum. This station is the northern terminus of the JR Takarazuka Line. Sasayama is a historical castle town which has restored castle buildings, several museums and galleries, and a preserved samurai district. Kaibara is a scenic market town, known for its wild game cuisine and it has several buildings of historical interest. Kaibara Hachimangu Shrine is the oldest shrine in the Tamba region and is notable for having a Buddhist pagoda within its grounds. Another local site of interest is the Kikone Bridge, which was built upon the roots of a zelkova tree that had naturally grown across the river. Fukuchiyama is the northern terminus of the JR Fuchiyama Line. Fukuchiyama city is best known for its castle, which dates from 1576, and for the preserved wooden houses in the Jokamachi area beneath the castle. 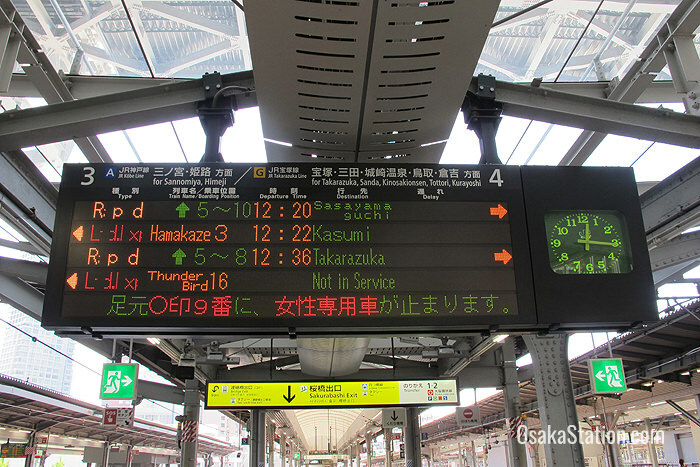 There are 32 stations between Osaka Station and Fukuchiyama Station. This line is served by Local, Rapid and Tambaji Rapid services which terminate at different destinations en route. Local trains stop at every station and are slowest, and the Tambaji Rapid service stops at the least number of stations and so it is the quickest. 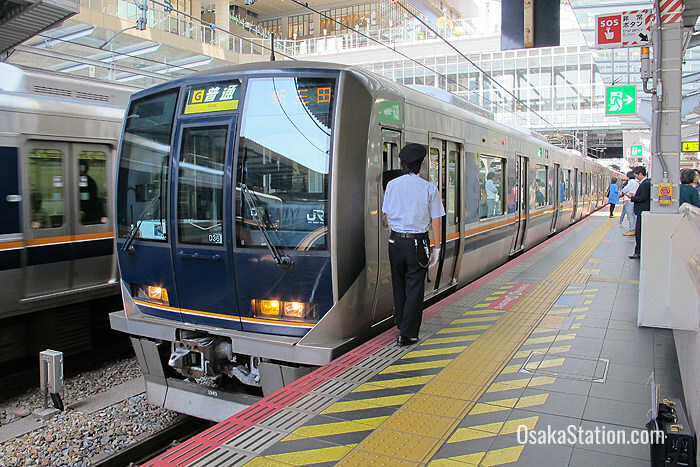 You can download a bilingual PDF of the JR guide to stops on which the stops for each train type are clearly shown. On this map the Takarazuka/Fukuchiyama Line is colored yellow. This route is fully covered by the Japan Rail Pass. 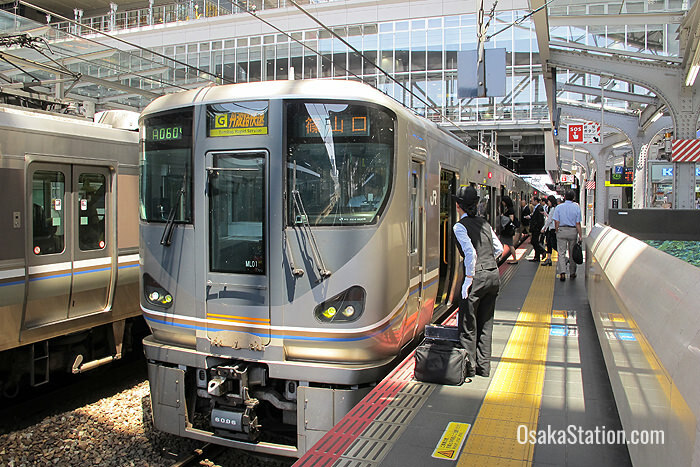 Use the JR West Timetable & Fare Finder to plan your journey.